As beautiful as your wedding venue may look standing naturally on its own, you may be seeking to add some embellishments to personalize the space for your special day. Beyond the expected bouquets of lush florals, an abundance of alternatives exist to tailor the reception to you and your future spouse’s liking. Savvy is on board to offer a list of simple decorations to style the setting of your wedding reception. Display the evolution of your love with pictures of the two of you growing up, the highlights of the evolution of your relationship, and your engagement photo shoot. These memories can be collaged artistically on walls as well as charmingly framed and set to adorn tables with snapshots of your happiest moments. You may also opt for a looping slideshow to project on a central wall that can integrate snippets of video memories that will no doubt evoke a sweet emotional response from friends and family who stop to watch. To set an elegant evening mood, create a glowing luminescence with extra lighting throughout the room. 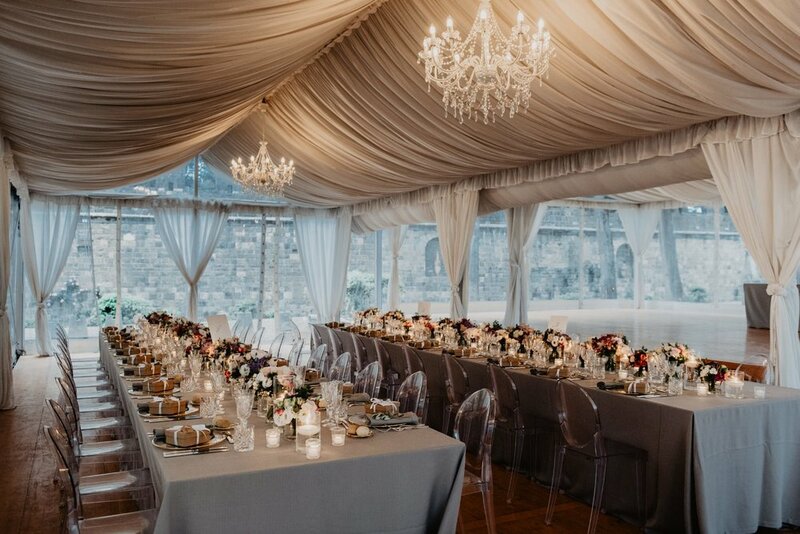 Some ways to execute this can be in the form of tiny string bulbs that delicately line the edges of the room, majestically glowing lanterns in paper or glass hanging from the ceiling, or small votive candles organized to illuminate the center of each guest’s table. Poster boards directing and welcoming guests to your reception may be essential for helping the flow of your wedding schedule, but can also be a fun way to add a hint of pizzazz to your venue. Another option is to display a catchy wedding hashtag or clever play on words of your names for guests to pose with. You may also desire to include a sentimental quote you love that expresses your values as a couple and intentions for the evening. If the roof of the room is feeling drab, tie billowing drapery from the beams for a fairy tale effect. These curtains are commonly seen in white to add a touch of grace, but could also be braided with other hues for an added pop of color. You may also consider combining lights as well for an additional standout impression. Galvanize your guests with eye catching elements to deck out their table and place setting during the reception. Choices range from classic table runners and numbers to polished vases and layers of glistening greenery. This is a great opportunity for those who love DIY projects to let their crafty side let loose. Any number of these ideas can be used to skillfully weave your venue and theme together into a flawless event. By deciding to customize with additional accent pieces, your wedding will stand out and express your unique personality.